Make your living room look more inviting and wow your guests. 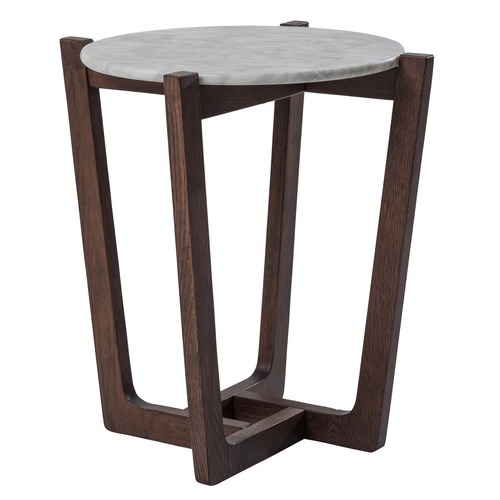 This gorgeous side table has an easy-to-style original design, featuring a thick Greek white marble table top and American oak legs that are finished with an American black walnut stain. With a luxurious white marble top that appears to float above the base, the table is an easy fit for any living space - big or small. Style a lamp, take a seat, and cherish your very own piece of original design. Estudio Furniture brings the sleek design of high gloss and matt furniture into Australian homes. Crafted by the finest tradesmen and manufactured with precision down to the last detail, their bedroom and living collections will enhance your home and be a talking point with your guests. Each piece is modern, exotic, sophisticated, easy to care for and with similar quality as that of an expensive hardwood. Mix and match through their ranges with the peace of mind that each product is easily assembled and professionally packaged for delivery. Lay back, relax and enjoy with the knowledge that it will look amazing for many years to come. The White Marble Monterey Side Table is a Contemporary or Mid Century style product. Contemporary style bridges the gap between traditional and modern. Pieces feature simple and clean lines with smooth surfaces without any carving or adornment. You can shop for more Contemporary or Mid Century Side/End Tables in the Furniture section of our site. When you buy a White Marble Monterey Side Table online from Temple & Webster in Australia, we make it as easy as possible for you to find out when your product will be delivered to your home in Melbourne, Sydney or any major city. You can check on a delivery estimate for the Estudio Furniture Part #: 10157-2 here. If you have any questions about your purchase or any other Side/End Tables product for sale our customer service representatives are available to help.Whether you just want to buy a White Marble Monterey Side Table or shop for your entire home, Temple & Webster has a zillion things home.